The Greater Peoria Chess Foundation is a 501(c)3 non profit organization dedicated to encouraging chess in our community and school systems. Chess helps students to develop many life skills that will help them as they navigate with challenges that lay ahead. A more complete summary of the benefits of chess can be found Here. 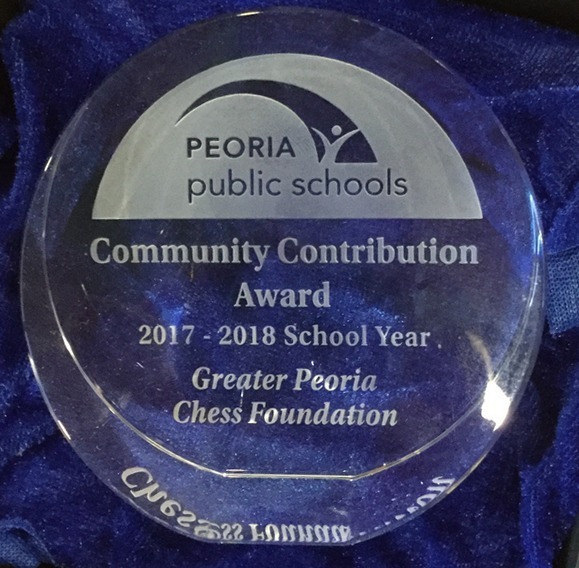 Peoria Public Schools awarded the 2017-18 Community Contribution Award to the Greater Peoria Chess Foundation at their June 11, 2018 Board meeting. GPCF provided chess sets and training software to PPS schools and supported a chess tournament at Von Steuben Middle School in 2017. Planned for 2018-19 are more tournaments and a program to provide low cost US Chess memberships to students. Dunlap leads IESA Championship, 36 local players win medals! See our News Web Page! Our school program consists of providing sets & boards to schools which have an active chess club or chess team which meets regularly and competes with other schools. We provide teaching chess software which can be used either with teacher instruction or placed on a computer so that students can do self learning. We also provide a curricula, complete with instructor's notes and integrated with the software so that teachers, who are not chess players, can provide beginning teaching of the game to their students. This year we have added USCF membership discounts for students who participate in organized chess competitions. All of these are free to the schools, they only need to have an active club and request the materials. For schools that are already active we can also help provide coordination with other schools as well as a schedule of tournaments for your student's participation. We also offer a summer chess camp, workshops, and the Friday night Hult Youth Chess Club. If your group has a particular need please let us know and we will see how we can help.